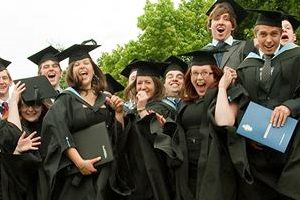 Are you a University of Southampton ‘graduand’? It’s a word that’s been flying around a lot in the past month, meaning someone who has technically completed all the requirements of their degree – but is yet to receive that all-important certificate. Graduation ceremonies are edging closer, ready to turn our ‘graduands’ into fully-fledged graduates – but are you up to speed with all the details of your ceremony? – You’ll need to collect your guest tickets half an hour before your ceremony begins, already dressed in your academic dress (that’s the gown) and with your printed e-ticket in hand (you’ll some sort of ID as well). – Morning ceremonies begin at 9.30am, 10.45am and 12 noon, whilst afternoon ceremonies begin at 2.15pm, 3.30pm or 4.45pm. – Don’t be late! The doors to each ceremony will close ten minutes before it’s due to begin. – Once seated, female graduates are required to keep their mortarboard on, whilst males are required to tuck theirs under their arm. – The ceremonies are approximately an hour long, and there’s no re-admittance – so make sure you’ve been to the loo beforehand! This is just the beginning of all the information provided for graduands getting ready to graduate – you can find the rest by visiting the link below. SUSU wishes all of our graduands good luck for the big day and for great success and happiness in their futures.